Ever have one of those days with your baby? You know, when they constantly get into stuff they’re not supposed to? Like the electrical cords, or the printer, or the TV cabinet or just any area that you try to block them from? It’s no wonder that Baby E’s fourth word was “No!” That’s all we say to him these days, or so it seems. Today was one of those days. He kept going for the printer. In fact, he successfully pushed it off the shelf. Ugh! I know, I should move the printer. I’ve already eliminated a lamp and rerouted cords. I’ve baby proofed the outlets with outlet covers and put in cabinet locks and moved all G’s little Lego toys to the basement and rearranged the boys’ bedroom so that he can’t reach anything he’s not supposed to from his crib and… I could go on and on… Sometimes we just need to teach limits. I guess that means that I’m doomed to repeat the printer scenario daily until he gets it. “Bad Babies” is one of my favorite kid songs. 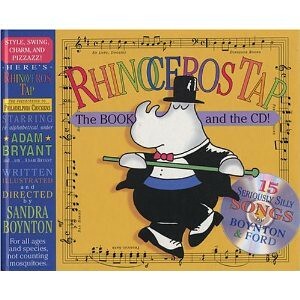 The CD came with the book Rhinoceros Tap by Sandra Boynton and we have been listening to it for years. It did take a short vacation when my two older kids outgrew it, but now it’s back (or at least it will be as soon as I go find it in the basement). I remember A singing this song to G when he used to get into her toys. Ha! I think she was even 5 year old – like in the song. My links will take you to Sandra’s website (above) and the book image will take you to the book on Amazon. You can find more music samples on Sandra’s website. Here’s hoping you had a better day without printers crashing to the ground. FYI – I have not been asked to endorse any product nor have I received any compensation for this post. I just truly love this book and the music that comes with it.